Then-Brazilian President Luiz Inacio Lula da Silva, second from left, with other world leaders in 2009. Newly sworn-in Brazilian President Luiz Inacio Lula da Silva, left, receives the presidential sash from outgoing chief executive Fernando Henrique Cardoso in Brasilia, Brazil. When Brazil returned to democracy in 1985 after almost 20 years of military rule, many observers were rightly pessimistic about whether the country’s political institutions could function. 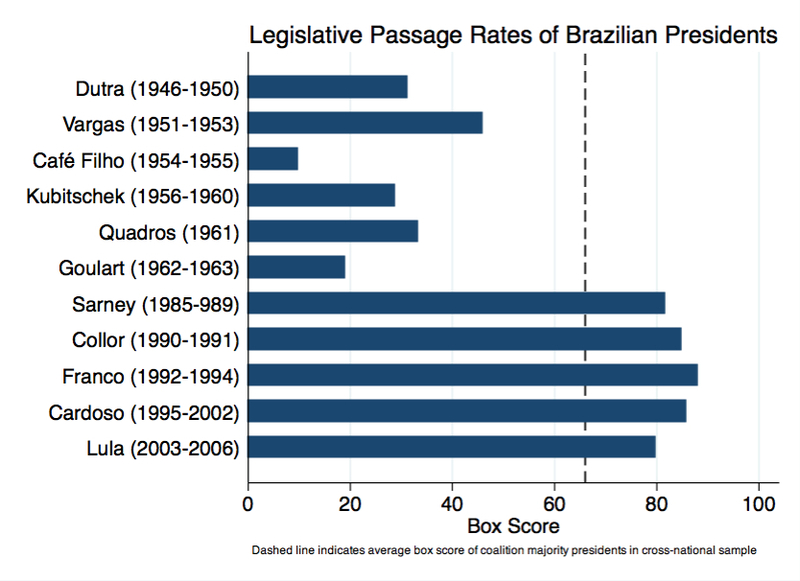 Brazil’s previous experience with democracy, during the so-called Second Republic (1946-1964), was characterized by executive-legislative deadlock. At that time, the immobility of chief executives contributed to a breakdown in the democratic process. In addition to the challenges produced by this legacy, the newly established Brazilian democracy of the 1980s took the form of a multiparty presidential regime with a fragmented legislature. That meant the president was unlikely to find sufficient legislative support, making democracy unlikely to prosper. The prophecy, however, did not materialize. In fact, in the past 30 years, Brazilian democracy has thrived. Much of the credit can be attributed to the ability of Brazilian presidents to craft governmental coalitions and avoid some of the pitfalls of multiparty presidential democracy, such as political deadlock, polarization and even regime breakdown. Judging just how good Brazil’s presidents have been, though, is not a simple matter. In principle, chief executives can unilaterally craft policy in a variety of ways. For example, they can “legislate” on their own through executive orders, decrees and regulatory ordinances. But governing via executive prerogative has significant limitations. In contrast, gaining approval through the legislature often allows chief executives to better insulate their policy choices from legal review and public disapproval. This route, however, hinges on the interactions between the executive and the legislature. Consequently, the comparative ability of individual presidents to obtain legislative approval of their initiatives — their political skill — tends to depend on the conditions under which they operate — something we might call luck. The notion that individuals should be given credit for being “good” rather than for being “lucky” is well known to sports fans. Consider Pelé and Diego Maradona, two of the greatest soccer players of all time. But who was the better of the two? In the summer of 2000, the world soccer governing body, FIFA, held an online poll to elect the Player of the Century. Maradona, a fan favorite, scored a resounding victory, obtaining 53.6 percent of the vote compared to 18.5 percent for Pelé, the candidate of the soccer establishment. FIFA hastily set up another jury composed of its own officials to hand out another Player of the Century award, which unsurprisingly went to Pelé. Both players were brilliant, but they competed in different eras. The rhythm of the game, the tactics on the pitch, and the makeup of their teams were wildly different. In fact, playing for Brazil, Pelé was usually the crown jewel of a team filled with talent. By contrast, when Argentina won the World Cup in 1986, Maradona’s side was hardly star-studded. Therefore, in terms of individual impact, Maradona was arguably the most dominant of the two. 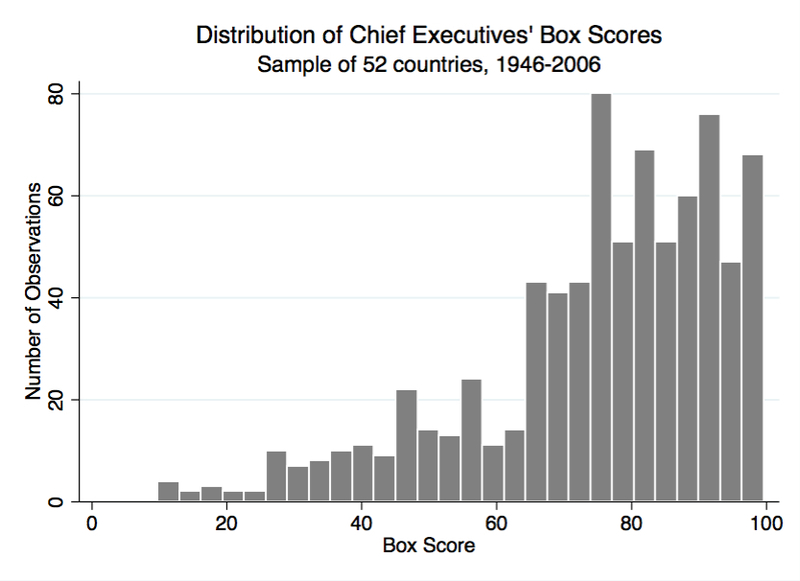 The chart below presents the distribution of these box scores in a sample of 52 countries in Europe, North and South America, Asia and the Middle East for the period between 1946 and 2008. Two trends are worth mentioning. First, the approval rate of executive-initiated bills varies considerably across countries and across time within countries. Second, on average, three-quarters of chief executives’ initiatives are approved. 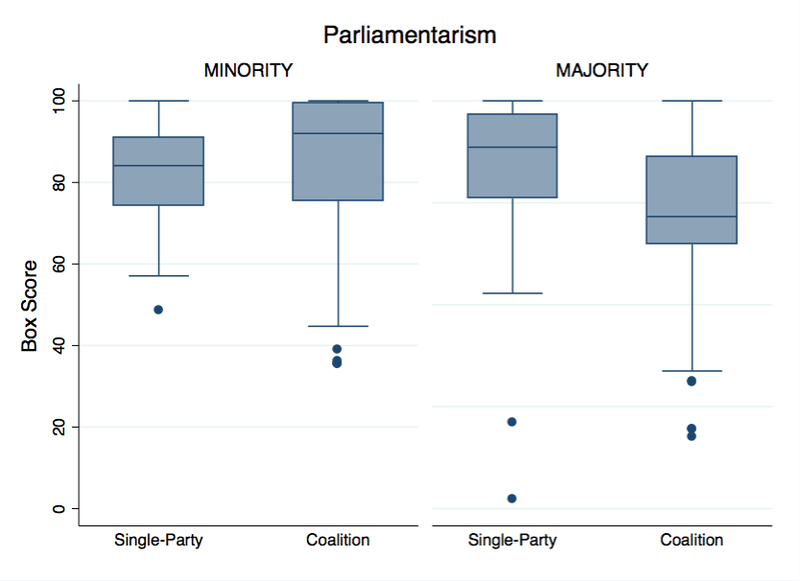 The charts below present the distribution of box scores under different constitutional structures (presidentialism or parliamentarism), and government type (single-party majority; single-party minority; majority coalition; and minority coalition). The data is displayed using a box plot. Each box extends from approximately the first to the third quartiles. Observations more than the 1.5 interquartile range beyond the first or third quartile are plotted individually. Prime ministers who lead single-party majority governments enjoy the highest average legislative passage rates (88 percent), followed by those who rule under minority coalitions (84 percent). Prime ministers who rule under a majority coalition are the least effective ones (with an average box score of 76 percent), followed by those leading single-party minority governments (with an average box score of 82 percent). 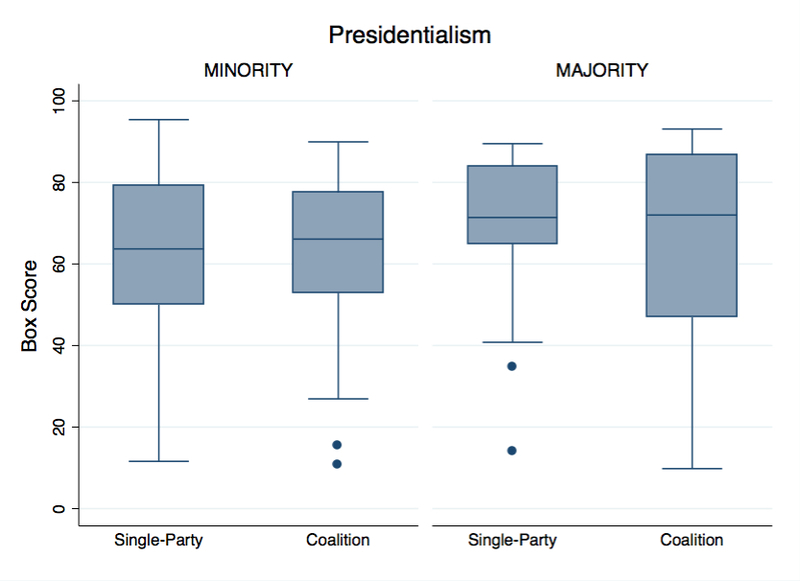 In the case of presidentialism, single-party minority governments exhibit higher passage rates (an average of 70 percent) than do coalition majority (66 percent) and coalition minority (62 percent) administrations. Since the country’s return to democracy, most Brazilian presidents lacked a majority for their party in the legislature, ruling under majority coalition governments. Nonetheless, as the chart below shows, their box scores exceeded those for the typical coalition majority president (indicated by the dashed line). The performance of these presidents was even more remarkable when compared to their predecessors from the Second Republic. So, how good are Brazilian presidents? While the average chief executive worldwide has a 75 percent legislative success rate, the average Brazilian president sees 84 percent of his proposals become law. And perhaps not surprisingly, the more effective a president is, the higher his approval rating. The chart below shows the unexpected performance (measured as the difference between the actual and the predicted box score) and the popularity of all the presidents who served during the period between the restoration of civilian government in 1985 and 2006.3 Note that each dot in the chart represents presidential performance in each individual year (not the tenure of an individual president). Presenting the data in this way allows us to examine how presidential performance varies over each term. 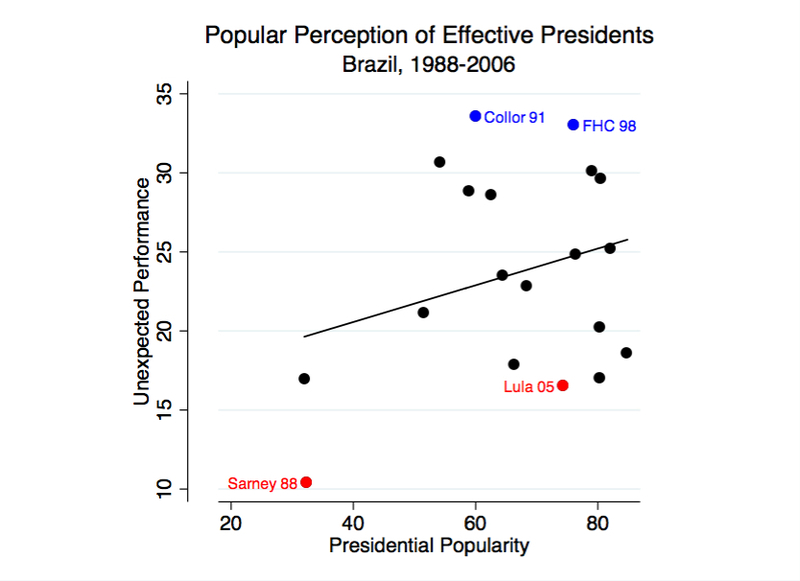 We can also see that Brazilian presidents who had unexpected success in a given year were more popular. Overall, the data indicates that when we take into account each president’s entire tenure, Fernando Henrique Cardoso was the most accomplished president of the 1985-2006 era in terms of legislative success, while José Sarney was the least effective one. Looking at success by year, the country’s most accomplished presidents during this era were Fernando Collor de Mello in 1991, followed closely by Fernando Henrique Cardoso in 1998. In contrast, José Sarney in 1988 and Lula in 2005 were the least effective. Collor became president in 1990 after beating Lula in a runoff election. He ran as a candidate of the National Reconstruction Party (PRN), which was merely an electoral vehicle. Riding on his popularity, Collor launched an ambitious plan of economic reforms that included privatization, opening Brazil’s market to free trade, encouraging industrial modernization, macroeconomic stabilization measures, and public debt reduction. Given that his co-partisans controlled a meager 8 percent of the seats in the Brazilian Chamber of Deputies, it is not surprising that he is the Brazilian president who exhibits the greater “unexpected” performance during this period, with an actual box score of 90 percent compared to a predicted one of 56 percent. Cardoso took office in 1995, and he was able to take advantage of public confidence, buoyed by his success in bringing inflation under control and by Brazil’s fourth World Cup win the previous year. In 1998, his actual box score was 91 percent, compared to a predicted one of just 58 percent. During that year, and following the adoption of a tailor-made constitutional amendment that allowed him to run for re-election, he won a second term with 53 percent. To date, he is the only president to win office without a runoff since popular elections were adopted in 1989. How about the underachievers? In 1985, when president-elect Tancredo Neves died, Sarney took office. A member of the military-aligned Social Democratic Party (PSD), Sarney was not very popular initially. In November 1986, following the implementation of the Cruzado stabilization program, his backers obtained a huge victory in the congressional elections. But as inflation soared in 1987, Sarney’s popularity sank precipitously, and by the end of that year, his electoral victory had turned to ashes. Although his actual box score for 1988 was 84 percent, the average for all the presidents during this period, it only exceeded his predicted score by 10 percent for that year. Let’s turn to Lula. A vote-buying case of corruption threatened to bring down his government in 2005. Known as the mensalão (or “big monthly stipend”), the scandal involved clandestine payments made by the ruling Workers’ Party (PT) to congressional allies in return for support for its legislative agenda. As the chart above shows, the scandal not only affected Lula’s popularity, but also his ability to pass his legislation. His actual box score for that year, 77 percent, was the lowest for the 1985-2006 period. So far, we’ve seen how the sabermetric approach can be used to settle questions regarding the relative legislative effectiveness of chief executives. It could be argued, though, that “careful” chief executives may fatten their “batting averages” by withholding legislation. 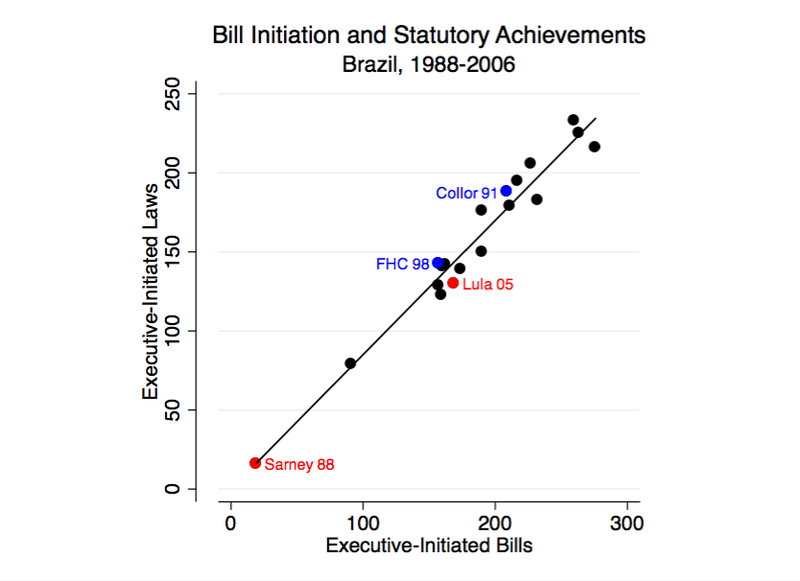 The chart below shows the number of executive-initiated bills approved by the Brazilian legislature as a function of the total number of proposals introduced by the president in any given year between 1988 and 2006 (i.e. the box score’s numerator and denominator, respectively). The dashed line represents the predicted number of executive-initiated laws obtained from a linear regression, where the number of executive-initiated laws is regressed on the number of executive bills. The data indicates that chief executives’ legislative achievements and bill initiation have a linear relationship.4 This rejects the notion that certain presidents were able to achieve higher box scores because they initiated fewer bills. For example, Itamar Franco introduced only 91 bills in 1994, whereas Cardoso introduced 157 in 1998. Yet the former had a box score of 87 percent, while the latter obtained passage of 91 percent of his bills. Finally, as mentioned above, we should expect legislative passage rates to regress toward the mean. An intuitive way to look at this is to return to the sports analogy. Outstanding performances are typically followed by more mediocre performances. Indeed, regression toward the mean explains such clichés as the Cy Young curse, sophomore slump and Sports Illustrated cover jinx. The same can be said about chief executives: They tend to alternate good showings with bad ones. And just as Alex Rodriguez’s impressive baseball statistics were not merely the result of hard work and pure athleticism, the success of some chief executives cannot be fully understood if we do not take legislative vote-buying (in the form of “horse trading,” “arm twisting,” “influence peddling,” “back scratching” or outright bribery) into account. Take, for example, Collor. In 1992, following a year of unexpected performance, a congressional investigation furnished proof that the president was enmeshed in a vast web of bribery. In September of that year, the Chamber of Deputies overwhelmingly voted for his impeachment, and Collor resigned only hours before the Senate convicted him on official malfeasance charges. Ironically, though it meant his eventual ouster, that corruption network was probably responsible, in part, for Collor’s legislative success. Legislative success is one key measure of a chief executive’s effectiveness, and passage, success, productivity, support, concurrence, dominance, control and influence all appear in the scholarly literature (sometimes these terms are used interchangeably). It’s safe to assume that in most, if not all cases, chief executives are not only concerned with whether their initiatives are considered by the legislature, voted upon or almost pass — what counts is whether the proposed legislation is enacted into law. Moreover, statutes are the definite measure of legislative output, whereas votes and positions on issues are merely means to an end of an uncertain consequence. Specifically, the box-score model involves a logit transformation of the percentage of executive initiatives approved by the legislature, while controlling for two additional variables: the share of seats held by a particular chief executive’s co-partisans and country fixed effects.” For more details, see Saiegh, Sebastian M. “Political prowess or “Lady Luck”? Evaluating chief executives’ legislative success rates.” The Journal of Politics 71.04 (2009): 1342-1356. The coverage of the data imposes a constraint on an “all-time” comparison of democratic Brazilian presidents, as my sample does not cover the rest of Luiz Inácio Lula da Silva’s administration nor that of Dilma Rousseff, the current president. The public opinion data comes from Datafolha and were obtained from Fernando Rodrigues’s website. The regression equation is Laws = 0.11 + 0.85 Bills, indicating that the predicted passage rate would be 85 percent irrespective of the number of bills a president initiates. Sebastian Saiegh is an associate professor in the department of political science at the University of California, San Diego. His research interests cut across the fields of comparative politics, positive political theory and political economy.